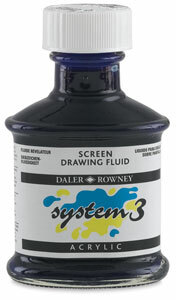 System 3 Screen Drawing Fluid is applied by brush directly to the screen to create the drawn image. It can be applied accurately when used full strength, but it must be diluted with water for application on finer detail areas. Use System 3 Acrylic Screen Printing Essentials in conjunction with System 3 Acrylics for a safe, solvent-free alternative to traditional printmaking. System 3's rich pigmentation assures the strong, clear color definition demanded by professional printmakers. What's more, System 3 Acrylics and mediums clean up with water.